It’s always nice to welcome Trevor Wray – and this time round he gave us a flavour of Argentina and Chile and its flora. In crossing the Andes twice last year he visited a range of different habitats – and recorded 138 cactus species. He found Gymnocalycium (erinaceum, mostii, capillaense) growing with garden favourites such as Dahlia pinnata (originally from Mexico) and good old ‘English’ bramble. Often the cacti would grow in grass, sometimes they would be completely overgrown by shrubs. Although Gymnocalycium ragonesii is said to be rare or even extinct in the few locations where this species grows (the salt lake Salinas Grandes), Trev reported that he could find quite a few, only that the plants appear to be almost hidden and drawn into the soil. It is a desirable species for cultivation and often seen in collections. Further up, he found varieties of Gymnocalycium spegazzinii, an equally attractive species to grow. Copiapoa featured heavily in his talk. Trev found often large groups of these, hundreds of years old, and growing within some stunning scenery. (There is a fascinating travelogue available to see on Flickr: see here.) 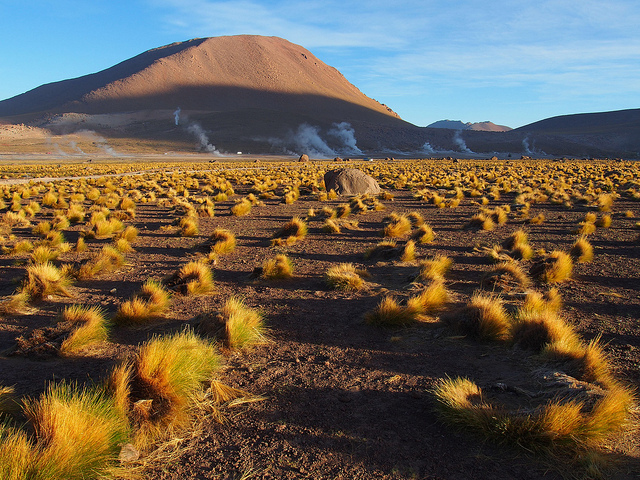 And where the landscape got really barren he would still find some Opuntia – near the El Tatio geysers for example. We are very pleased to say that Trev will be back in February next year with his talk “Life and death in the desert”, revisiting habitat sites over several years and recording the changes which occurred over that time. If you’ve missed this talk, be sure to come along then!